A ditzy blonde can always be counted upon for a laugh in a comedy. Yet in the case of Born Yesterday, she is also the fixture that gives the play its soul. In this excellent Doug Hughes-directed revival, Nina Arianda as Billie Dawn displays not only the discovery of a woman’s independence, but also the awakening of a spirit. Set in Washington, D.C. in 1946, Harry Brock (Jim Belushi) is a blustery tycoon who blows into town with his trophy girlfriend Billie (Arianda) with plans to make millions through a method in which Uncle Sam would not approve. Worried that the thickheaded Billie will clash with his high-influence potential cohorts, Harry hires Paul Verrall (Robert Sean Leonard) as a tutor to sharpen her edges. However, Harry awakens a sleeping monster in Billie that will foil his political plans. Directed with thorough care by Hughes, Arianda creates a window into Billie that begins foggy and gradually clears to allow full visibility. Taking playwright Garson Kanin’s quip-filled script, Arianda nails the jokes in Act I by conveying Billie’s ignorance. In Act II, her Billie’s humor changes to reveal her newfound confidence and feistiness. Yet it is more than Kanin’s solid writing (which holds up shockingly well from its debut in 1946); every gesture and expression from Arianda builds upon who Billie is. I left the theater feeling as if I knew Billie in real life. Arianda gives true insight into Billie, doing so with a vibrant and ambitious energy that reflects her eagerness to be on stage. Arianda tackles this character with such force that she has left no inch of Billie’s stage time unmarked. Arianda has fiery chemistry with Belushi, who seems extremely committed and comfortable as the bossy Harry. Their arguing and cheap shots at each other somehow feel fresh compared to other tired examples of volatile couples. By belittling and dismissing her, Belushi creates a cage in which we see Billie is trapped and manages to make it both comedic and frightening. His is also a fully-thought performance. While Arianda is busy filling silences with some golden gestures, Belushi’s presence and delivery equally fill the stage. It is often difficult to decide which performer to look at. Leonard manages to just skate by in the thankless role of Paul, who gives Billie the gift of thought. Yet despite the role mostly serving as a tool to advance the plot, if Arianda could pepper every moment with nuance, Leonard seems to take a less ambitious approach. His decision shows, as he is largely unmemorable. What he accomplishes, however, is allowing Arianda to further flesh out Billie, as through Paul, she displays her kind-hearted nature via gratitude and affection. The romance that crops up between the two is unnecessary and is punctuated by the fact that Ariana and Leonard share no chemistry. While the central performance displays stunning nuance and detail, so do the set and costumes by John Lee Beatty and Catherine Zuber. The Washington hotel room in which the play takes place is an ornate, luxury suite washed in a gorgeous royal blue. A rich, gold banister and heavy, dark wood doors make the room opulent and striking. At the performance I attended, the first sight of the hotel room drew quiet gasps from the audience. Zuber’s costumes are attractive and worn well by the entire cast. 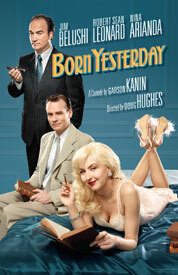 Born Yesterday has much to offer in terms of comedy, but concludes offering more than heady laughs. It’s a comedy that bares such heart. To take the naïve woman who garners cheap laughs at her expense and give her hope of a better life is something the audience can truly cheer for. Having Arianda guide this new woman toward her destiny makes the journey even more of a pleasure. Billie is ready to conquer so much, and I eagerly await the same from Arianda.